Enduro is not a bike. Enduro is a race discipline, a motorcycle category, a riding style. It is open-faced helmets, goggles and bright colors. Enduro is not a bike. At the very least, it is two bikes. 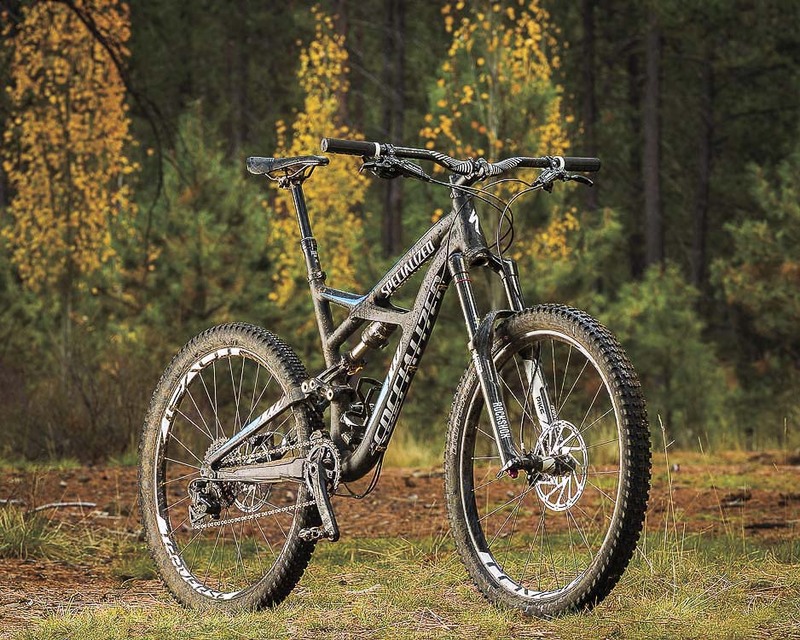 We tested both the 29-inch Enduro and the new 650b version. The latter piqued our testers' interest, given how perfectly the smaller wheel size fits with the Enduro's best-of-both-worlds mantra. It had a slacker headtube, snugger chainstays and a little more rear-wheel travel than its year-old 29-inch counterpart. "This," said Wolverine to The Incredible Hulk, "is gonna be a good fight." The climbs weren't a fair match. The 650 slouched a bit in its travel, though the 'Climb' setting on the Cane Creek Inline shock rested the rear end higher while still keeping it active. The 29er's larger wheels and steeper angles made climbs pass much easier. The aluminum frames wouldn't be considered lightweight, which stung a little given the respective $5,000 price tags. But the price was well-reflected in the top-notch spec. SRAM XO 1×11, the beloved Pike front end, reliable Roval wheels and that very techy rear shock are the stuff of even higher price points–only a carbon frame separates the Elite model from the $6,600 Expert. The three-position Command Post dropper was the only part not welcomed. Testers would have preferred an infinite-dropper post. We had questions about the new bikes before we even got our test rigs, so we sent out a few queries—the kind of things we thought you might be asking yourself when you're looking at this bike. Then we sent out another round of asks if any major questions or issues came up during testing. Here's the feedback we received from Specialized Bicycles' global public relations manager, Sean Estes. VERNON FELTON: What sets the Enduro apart from some of the other bikes in the all mountain/Enduro niche? SEAN ESTES: When designing the Enduro, our goal was to do everything we could to give riders the best of both worlds. That design philosophy resulted in a bike that accelerates like a light trail bike, gobbles up rough terrain like a mini-DH, and corners with surgical precision. All attributable to how the FSR kinematics were laid out, the slack nature of the bike, the purposely low BB, and incredibly short rear end. We weren’t really looking at other bikes, we were looking at what this bike needed to be…I suppose that’s why, once all the dust settled, the Enduro ended up being a pretty unique bike. VF: Who's the ideal rider for the Enduro 29er and how does that differ from the ideal rider for the Enduro 650b? SE: There’s no ‘right’ answer, it’s really best left to the Rider to decide, which is why we offer both versions. The 29er has the shortest rear end out there, shreds corners and eats rocks and roots alive. It will change the way you think about 29ers but if you can't stomach the idea of a 29er, then go for the 650b. You still get the benefit of improved rollover over 26-inch. There are a number of reasons why a given Rider might prefer one over the other but at the end of the day they both absolutely rip. Bigger is better – with 650b and 29 options the rider can choose how big is right for them. VF: The 650b Enduro sports a 26er front end, which has made some people question if that compromises the bike’s ultimate performance on the trail…Your thoughts? SE: Not at all. 650b is actually only a little bit larger than 26-inch and since the Enduro chassis was already designed with plenty of clearance for big tires and deep travel, a slightly redesigned rear-end was all that was needed. Additionally, since the 26″ version came out a few seasons ago, trends have pushed towards lower and slacker bikes, so utilizing the existing front-end shape allowed us to actually modernize the geo, giving Riders exactly what they want without any comprise whatsoever.